Jessie Brennan is a visual artist whose previous projects have been concerned with public housing and the politics of regeneration. In spring 2017, the South London Gallery (SLG) invited Jessie to collaborate with the residents of Pelican Estate on a project titled YOUR WORDS. 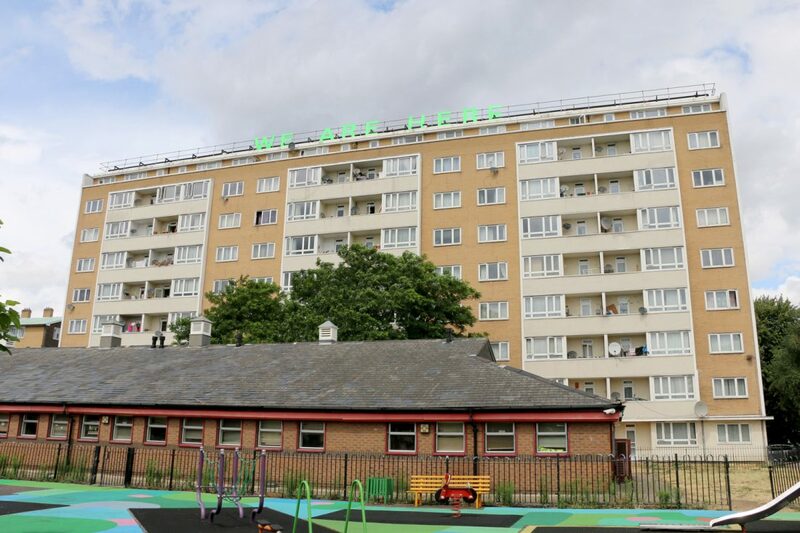 Jessie invited residents to share stories of life on the estate, some of which were then transformed into large and small-scale temporary installations across Pelican. To mark the end of the project Jessie presents WE ARE HERE, a text installation on the roof of Heron House and a poster publication distributed to residents, which documents some of the conversations, contributions and research developed over the course of the project. By Jessie Brennan. Click here for the essay with full references. These are the words that Pelican Estate resident Saloua exclaimed in exasperation when she first moved to London from Morocco in 2009. As a newcomer to the city and a council tenant, she explained to me that, like many others who are attempting to build their lives here, she felt invisible and ignored. 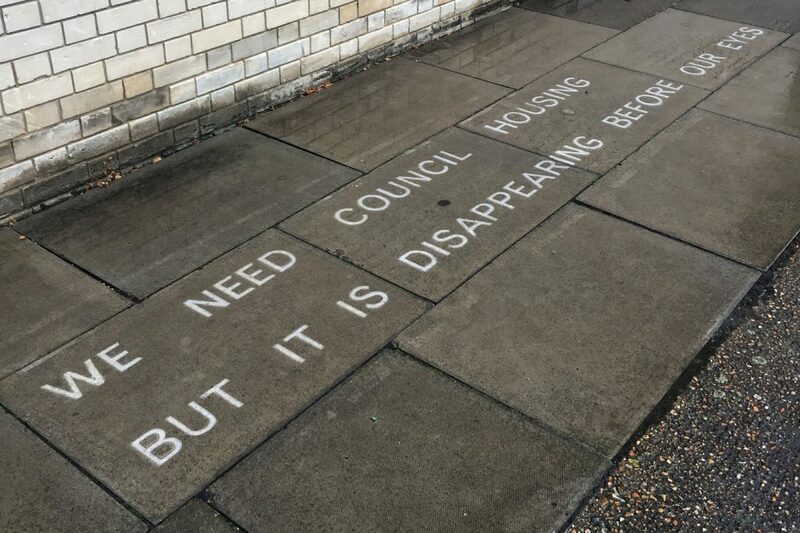 That many people who live on council estates share these experiences, of feeling unheard, says a lot about the neoliberal policies and processes by which public housing, in both value and form, is being undermined and dismantled. Public housing provision in the late 1950s and ‘60s, when Pelican Estate was designed, was a thing of national pride – for those who built, administered and lived in it. But following policy changes (e.g. Housing Act 1980, which included ‘right to buy’) by successive governments, what was once affordable and secure accommodation for people on low incomes is today being privatised through redevelopment or ‘regeneration’ schemes. The phrase WE ARE HERE comes not only from one person’s experience, but resonates throughout a great many individuals’ stories that were shared with me. During the many conversations, over several months, with people who live and work on Pelican Estate, I learned the defiance, humour, and joy with which those words were spoken and multiple meanings conveyed. WE ARE HERE celebrates the value of public housing and speaks to the broader challenges often faced by those on council estates: the stigmatisation of social housing tenants; the lack of maintenance and ‘managed decline’ by councils; the threat of demolition and redevelopment by policies that value private ownership over state-funded homes. The conversations encountered online here (and across the folded pages of the poster publication), reflect the care and resilience expressed by Pelican Estate’s communities, in different ways, when it comes to valuing their homes, as public housing. Of course, behind the subjective pronoun ‘we’ lays a complexity: WE ARE HERE refers not to a homogenous community but rather many diverse communities that are interwoven along lines of class, race, age, disability, gender, among other social stratifications and power relations. In this sense the project tries to acknowledge the shifting, multi-vocal authors of those words and their entanglement in this place – not only Pelican Estate residents but commissioned artist and gallery institution too – depending on who utters them. 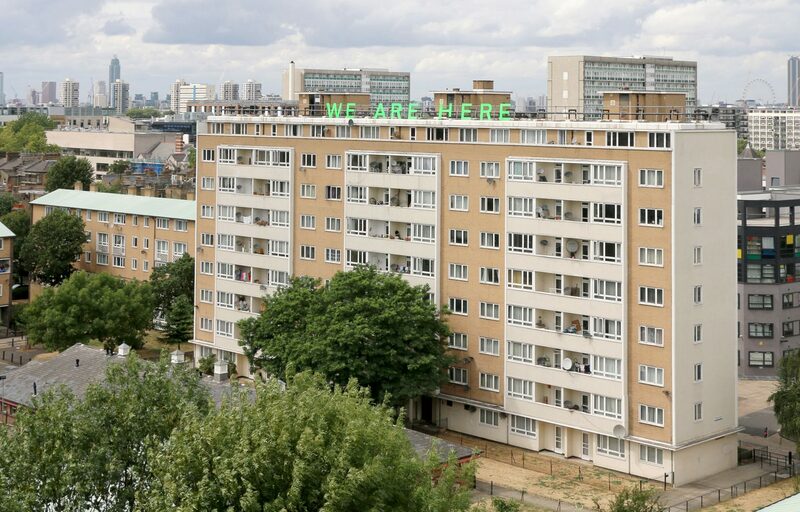 The words WE ARE HERE gesture towards their productive political use – as an act of affirmation for the value of public housing and resistance to its loss across London – in the form of bright green textual work. Installed on the roof of Heron House, WE ARE HERE is made visible to inhabitants from within Pelican Estate but also to those people who might never enter one, at a distance. A great many Pelican Estate residents are alert to the forces of ‘state-led gentrification’ and they are aware of the notorious examples of demolition and redevelopment in Peckham (e.g. the former Five Estates demolished in the 1990s) and across the London borough of Southwark (e.g. the former Heygate Estate demolished in 2012, and the threatened Aylesbury Estate), which results in displacement and dispossession of tenants and leaseholders. 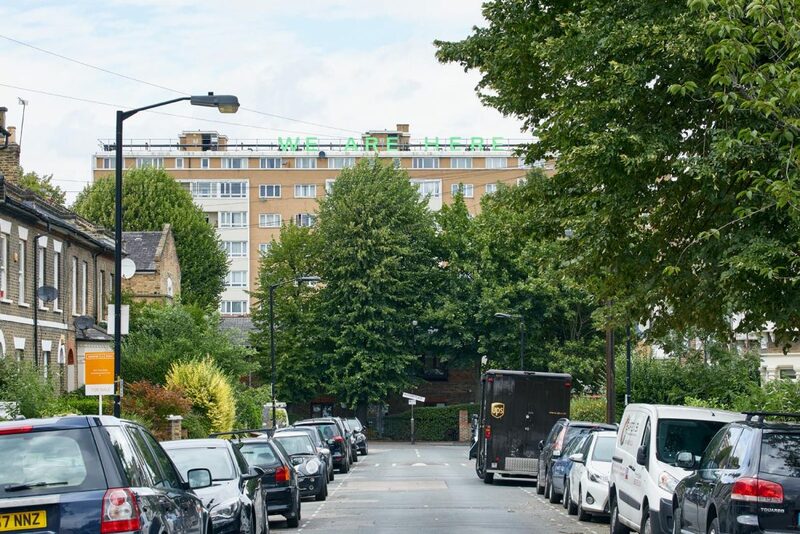 While I am unaware of any redevelopment proposals for Pelican Estate, I was appalled to discover its status as an apparently ‘low value’ estate in a 2015 survey carried out by private property management company Savills, for Southwark Council. These are the sorts of conditions – both material and ideological – ascribed to council estates, which their residents must voice and contest even while fighting for survival. 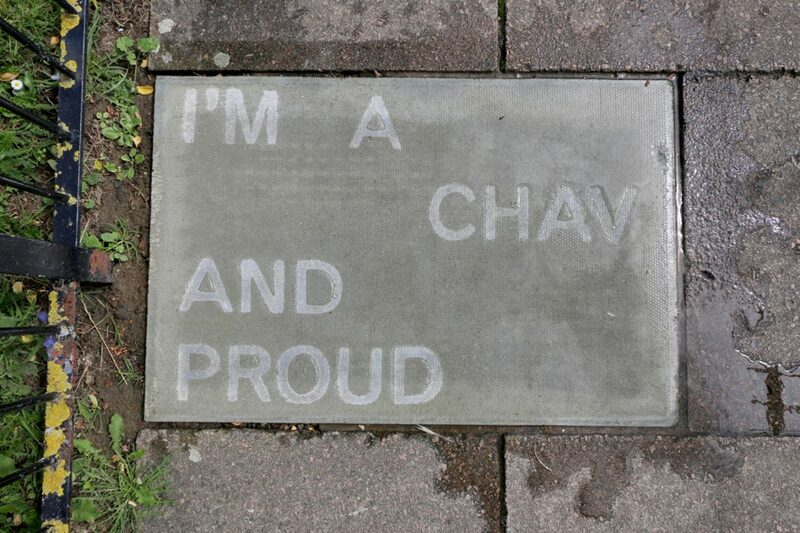 YOUR WORDS attempts to amplify the voices of residents by generating a platform from which politically pertinent issues relating to the negative perception of council estates – perpetuated by politicians, developers and mass media (and anyone who hasn’t visited one) – compared with the lived experience by their inhabitants, are explored and made public. The intention of the project is to contribute towards a broader counter-narrative – against so-called ‘sink’ estates and such narratives of decline – by creating everyday spaces of resistance (literally inside living rooms, play areas, and on roof-tops), in which stories of critique and hope are voiced and fought for. Pelican Estate was built by the London County Council (LCC) between 1956 (when the first residents moved in) and 1964 (when Crane House was completed). It consists of 247 flats and maisonettes distributed across nine residential buildings: Crane, Curlew, Falcon, Gannet, Heron, Kingfisher, Mallard, Osprey, and Tern House, which are loosely clustered around a central green space. Homes are predominantly occupied by Southwark Council tenants. Pelican Estate is located in Peckham, south-east London. According to the latest UK Census 2011, there were 71,552 residents estimated to be living in Peckham and Nunhead, an area which is ethnically diverse and falls within one of four Area Action Plans (AAP) in the London borough of Southwark. The Peckham and Nunhead AAP contains policies and masterplans for key regeneration areas, including Rye Lane and Peckham Rye station, and gives some indication of the sweeping urban development – changes never neutral or free of social and political consequence – planned by Southwark Council. What follows is a series of conversations between Jessie Brennan and Pelican Estate residents. A version of the introductory text and some of the conversations between Jessie and Pelican residents can be found in the printed poster publication, available from the South London Gallery. Special thanks to the people who made this project possible by their hard work, enthusiasm and contributions. Abdu; Abdul; Adetayo; Andy; Arnold; Carolina; Catherine; Chantel; Chevelle; Churno; Claudia; Denise; Elaine; Elvis; Emily; Fatima; Greg; Halima; Henry; Iqra; Jenny; Julia; Julie; Kristos; Lady Di; Larry; Leah; Leanna; Leila; Lucia; Lucy; Lynette; Madeleine; Maria; Marva; Mary; Matthew; Messaouda; Mustapha; Norman; Paul; Paul; Robin; Rukayat; Rushaine; Sally; Saloua; Samuel; Sandra; Scott; Şifa; Soloman; Susan; Susan; Tal; Trevor; Wendy; Yousef; and all the people unnamed here (or wish to remain anonymous) who engaged in conversations on Pelican Estate, Talfourd Road, Talfourd Place, Denman Road, and Grummant Road. Acknowledgements: Pelican Plus, Tenants and Residents Association (in particular Joan and James); South London Gallery staff team; and Southwark Local History Library and Archives. On the special occasion of the new installation WE ARE HERE on the roof of Heron House, we would like to thank Jessie for all of her work. On the Pelican Estate, we face the very real prospect of changes to our housing and the way it is managed – making the themes explored by this project pertinent and crucial. If you live on Pelican Estate please tell us what you think and need. To get in touch email pelicanplus@gmail.com or call 0738 3432559. YOUR WORDS is part of Open Plan, the South London Gallery’s long term public art and education project with residents living on Elmington, Pelican and Sceaux Gardens Estates. Open Plan is supported by the Freelands Foundation.